The following article was written by Ruth Enns and published on April 22, 2013 by CBC News Manitoba concerning the case of Susan Griffiths. Ruth Enns is the author of A voice unheard: The Latimer case and people with disabilities. This is her essay opposing the legalization of assisted suicide in Canada. By Ruth Enns - CBC News Manitoba - April 22, 2013. In theory, legal assisted suicide sounds compassionate and safe, promising autonomy. How could one person’s decision about their own body possibly harm someone else? In reality, assisted suicide doesn’t live up to its billing. For example, we know suicides can trigger copycat suicides, and we do everything possible to prevent such tragedies. But I hear nothing about discouraging copycat assisted suicides. Why the double standard? A clue to the double standard lies in the commonly used phrase “quality of life” (QoL). In medical contexts, QoL seems to be code for disability, pain and proximity to death with frequent conflation of these three. People with disabilities regularly encounter misperceptions of their “suffering” and pain. They find others rate their lives and QoL lower than they do themselves. Assisted suicide proponents assume people would intrinsically assess their own QoL. However, apparently most people can’t readily distinguish between intrinsic and extrinsic evaluations. Robert Latimer killing his disabled daughter was often portrayed as synonymous with Sue Rodriguez’s fight for a physician assisted suicide. The Latimer case fit the definition of first-degree murder while Rodriguez was an adult apparently making her own decisions about her own life. If in practice we can’t tell the difference between assisted suicide, euthanasia and murder when the victim is disabled, how can we say legalized assisted suicide would be no threat to marginalized people? Whenever this question arises, the automatic assumption of assisted suicide proponents is opponents are against choice. I want my wishes to be honoured as much as anyone else. However, I also value equal participation in community. We all need autonomy but not at the expense of belonging. Also, while suicide involves only the person choosing to die, assisted suicide involves at least one other person and, therefore, it cannot be just an individual choice. Where does choice lie when there is an imbalance of power? Doctors’ superior medical knowledge and positions give the, not only more power than their patients but also power over their patients. Those of us without medical knowledge can never know whether information is being withheld or given selectively. We rely on trust. If our doctors have the authority to end our lives, what happens to that trust? How can we make informed decisions without adequate information? How can we tell when we are being coerced into agreeing with our doctors? Who is really making medical decisions about us? Manitoba doctors have made themselves the final authority in disputes over withholding or withdrawing life-sustaining treatment. Where is the choice for the patient? In my book on the Latimer case, I described the late Mike Rosner’s experience with his doctors in 1992. Instead of treatment for his treatable pneumonia he was offered “death with dignity.” Only with the help of friends was he able to get the treatment he needed and continue with his productive life. When death for those of us with disabilities is termed “dignified” it implies that our lives are not dignified. When those holding our lives in their hands devalue us and deny us treatment for treatable conditions, where is our choice? Double standards and imposed or coerced premature deaths are rooted in a strong cultural bias against life with disability. We recognize bullied teenagers who choose to end their lives have been pushed to that extreme. We do not seemingly recognize people with disabilities are also bullied and often socially isolated. Martin Norden (Cinema of Isolation) said in film, disabled characters are either cured or killed, literally or figuratively. 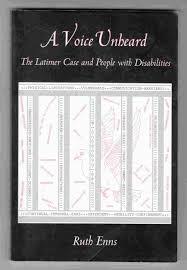 As with the Latimer case, people with disabilities are most notable by their exclusion from the scripts. Such obvious prejudice in our culture constitutes cultural bullying and emotional abuse leaving many people with disabilities feeling emotionally abandoned, worthless or traumatized. How can we say choosing assisted suicide in the face of such a strong negative bias is any more rational than the "choice" of the bullied teenager? In this cultural script of life, legalizing “death with dignity” would strongly imply that if we become burdensome, we become undignified and unworthy. If we want to be worthy, we should bow out. Where, then, is the choice for people with disabilities, for anyone from a marginalized group? With pervasive inability to differentiate between intrinsic and extrinsic evaluations, how can safeguards protect anyone? Alex Schadenberg of the Euthanasia Prevention Coalition has shown that in Belgium the safeguards are routinely ignored, and of those doctors who ignored them, most didn’t even realize they had strayed from assisted suicide to euthanasia and even murder. Where was the choice for these doctors’ patients? Polls on assisted death abound, usually revealing huge support. But do these polls really measure what they claim to be measuring? Since most respondents in such polls probably have little or no firsthand experience with disability or death and dying, how can they predict what they will want in circumstances they haven’t experienced? These polls create the impression of public support for assisted death when in reality they may be an expression of the negative cultural bias and fear surrounding life with disability. Fear of becoming disabled is rational. It keeps most of us from putting ourselves in harm’s way. However, living with disability is also rational and dignified. Those of us living with disabilities didn’t choose our disabilities. We are simply ordinary human beings using ordinary resilience to make lemonade from the lemons life hands us. These polls don’t reflect our experiences or choices. What would legalized assisted suicide do to assistants? How do medical people go from helping people to live to providing the means to die? Do such assistants become desensitized, perhaps even to the point of ignoring other possibilities for the people they are "helping?" Do they have to shift their perceptions of themselves and their roles? Certainly the ones who find such assistance easy are the scariest. According to Alex Schadenberg’s book on euthanasia in Belgium, most of those doctors who ignore guidelines and kill people without consent do not even classify their actions as euthanasia. We human beings are very good at rationalizing our actions. I sympathize with Susan Griffiths’ fear of her prognosis. My opposition to her decision doesn’t mean I would want to see people like her forced into a dreary, meaningless existence. We do have the right to refuse medical treatment. Nor is my opposition an attempt to evade death. I am simply begging her and others contemplating similar decisions to please consider the effects of their actions on others. 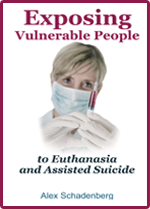 Link: To learn more about the current practice and abuses of the Belgian and Netherlands euthanasia laws, by ordering the book, by Alex Schadenberg ($20 includes shipping): Exposing Vulnerable People to Euthanasia and Assisted Suicide. Exposing Vulnerable People will prepare you to oppose the legalization of euthanasia and assisted suicide.